"You'd better be what we think you are. 'Cause if you're not, there's no hole deep enough to hide you this time." Behind the camera, Martin Ritt was the sort of old pro that we don't see much anymore. He brought a certain level of skill to whatever piece of material he was working on, and especially in a movie like Norma Rae, demonstrated a keen empathy with the working class, without slipping into obvious and patronizing bromides about the nobility of labor. 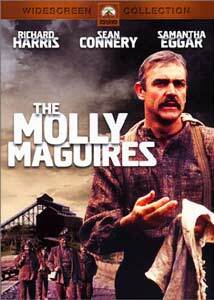 His visual portrayal of an 1870s Pennsylvania mining town is probably the best thing about The Molly Maguires, a handsomely mounted film with some impressive visual sequences that frequently feels, in story terms, a little thin. There's deep unrest among the mining men in western Pennsylvania; theirs is a filthy, tiring, unhealthy and unpleasant job, and they've about had their fill. Insult to injury, of course, is the blithe way in which management exploits them, even makes them pay for their own supplies out of their already meager paychecks; if Marxism were ever to take hold in America, it would be under working conditions like these. And in fact, there are some low rumblings—a renegade group of miners are sabotaging the mines, waiting until they're cleared out of them for the day and then detonating explosives. In fact, the opening sequence, in which we see the miners on the job, planning their guerrilla actions and then putting their scheme into action, entirely without dialogue, is perhaps the apex of the filmmaking here. A secret sect exists among some of the miners, called the Order of the Hibernians; there's a subset of that group, even more covert, called the Molly Maguires. Sean Connery plays Kehoe, their de facto leader; the mine owners are obviously none too happy about these terrorist activities, and send in an undercover man (Richard Harris) to root out the discontented. Walter Bernstein's script adheres to the rules of this kind of storytelling—as McKenna, Harris is first reviled and shunned as an outsider, then gradually accepted into the community, then brought to the very heart of the Mollies. (In more than one respect, the structure of Donnie Brasco has an uncanny resemblance to that of this movie.) So we pretty much know what's going to happen; when McKenna locks eyes with raven-haired Mary (Samantha Eggar), it's a guarantee that she'll be the love interest. Much of the movie goes along at a stately, almost leisurely pace; Ritt is skilled enough to bring us along, but you soon realize that Bernstein's screenplay is a little thin, that there isn't a whole lot of story material here. Similarly, Ritt has made the brace choice to keep the musical scoring to a minimum; it adds to giving us a keen sense of time and place, but it can also make some of the scenes seem almost torturously slow. Connery is a stolid presence, but he's badly underutilized; when he works up a head of steam late in the picture, you realize that you really don't know very much about him, or any of these men, or about their community. The professionalism of the filmmakers and their compassion for their characters go a long way toward sustaining our interest, but ultimately there isn't a whole lot to this movie, aside from a high level of Hollywood craftsmanship. Image Transfer Review: This is a very sloppy transfer, full of scratches, from a print that looks as if it was pretty well beaten up to begin with. Little or no effort went into sprucing up the movie for DVD; it shows. Audio Transfer Review: The newly remastered 5.1 track isn't much of an improvement on the original mono; listening to either is a strain, for they both sport their share of crackle, room tone, hiss and other aural interference. These can overwhelm some of the scenes, especially when the actors are speaking in hushed tones; you'll want to keep your remote nearby, to put on the subtitles and follow along with all the stuff that's so difficult to hear. It's damning this movie with faint praise to call it "professional," but that's about right; Harris and Connery are typically excellent, as is Ritt's work, but the film isn't especially memorable.